Olympic Cauldron at Jack Poole Plaza. Photo by Sue Frause. 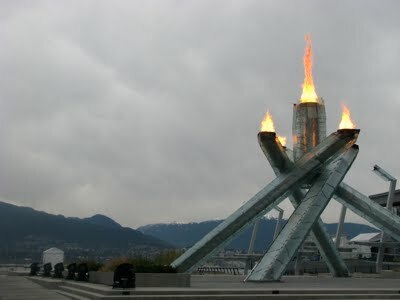 The Olympic flame burns bright in the cauldron located at Jack Poole Plaza west of the Vancouver Convention Centre, which is serving as the International Broadcast Centre during the 2010 Winter Games. The plaza was named for the founding chairman of VANOC, Jack Poole, who died in October 2009. The cauldron overlooks Coal Harbour and the floating set of Olympic rings off Stanley Park, and beyond to the North Shore mountains. Once the Olympics are over, the cauldron will go dark.